While bloggers sometimes focus on the same broad subject matter as the mainstream media, as last week illustrated, they can choose to explore very different aspects of those themes. 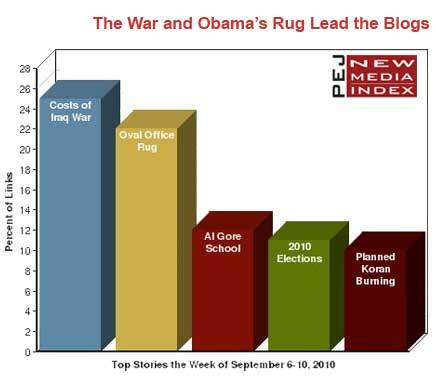 For the week of September 6-10, one-quarter (25%) of the news links on blogs were about the war in Iraq, making it the No. 1 story according to the New Media Index from the Pew Research Center’s Project for Excellence in Journalism. One week earlier, when the mainstream media focused on Iraq, and primarily on President Obama declaring an end to the combat role, the social media largely ignored the subject. But bloggers got interested later when a Washington Post column revived a debate over the long-terms costs of the war. News about the Obama White House was the No. 2 story on blogs (22%) and the No. 5 story in the mainstream media. And while a good chunk of the mainstream coverage focused on someone possibly leaving the administration–chief of staff Rahm Emanuel-the bloggers opted to talk about something that had just arrived–the new rug prominently displayed in the Oval Office. The social media conversation about Iraq followed a column in the September 5 Washington Post concluding that the true cost of the war-factoring in the costs of treating veterans, increases in the cost of oil and the impact on the national debt-is far greater than previously thought. Written by Joseph E. Stiglitz, the chairman of President Bill Clinton’s Council of Economic Advisers, and Linda J. Bilmes, a senior lecturer in public policy at Harvard University, the piece expands on an estimate the two made in 2008 when they originally came up with the $3 trillion number-although they offered no specific new price tag. Blogosphere reaction to the piece was dominated by those who opposed the war and took the opportunity to express their frustration with the costs, both in lives and in dollars. Many also seconded on the writers’ assertion that one of the consequences of the war was that the U.S. debt increased and the country was less prepared to deal with the subsequent economic crisis. The Oval Office rug conversation revolved around what some bloggers saw as a significant mistake. The new rug is lined with quotations, including one attributed to Martin Luther King, Jr.: "The arc of the moral universe is long, but it bends toward justice." While a direct quote from King, the statement was a paraphrase of the words of Theodore Parker, a Bostonian Unitarian minister King admired who died on the eve of the Civil War. The September 4 Washington Post article about the quote controversy was frequently linked to by bloggers, some who blamed Obama himself for not knowing his history. The No. 3 topic on blogs, at 12%, was a Los Angeles Times story about a school named for former Vice President and environmental activist Al Gore but built on an area that may have toxic and contaminated soil. Fourth, at 11%, were two Washington Post pieces about the 2010 elections: the results of a poll showing Republicans making gains and a column by Eugene Robinson, which described the frustrated electorate as having a "temper tantrum." That was followed, at 10%, by several reports about the Florida pastor who announced plans to burn the Koran on September 11 despite significant opposition from many political and religious leaders. Rev. Terry Jones did not go through with the burning, but the story generated large amounts of media attention. In addition to its fifth-place finish in the blogosphere, the subject was the third-largest story on Twitter (at 13%), a component of the most viewed YouTube video last week (see below), and was the second-largest subject in the mainstream press, according to PEJ’s weekly News Coverage Index. 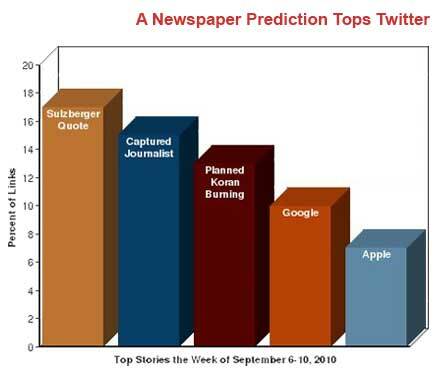 On the social networking site Twitter, the top two subjects last week highlighted the intersection of technology and journalism. The top story, at 17%, was a Mashable report about a statement made by Arthur Sulzberger, Jr., chairman of the New York Times Co. At a recent conference, Sulzberger said he expects his newspaper to stop publishing a print edition sometime in the future due to the losses in readership and the growth of news consumption on the Web. Tweeters responded to the quote with a mix of surprise and satisfaction that the old media was recognizing the importance of online news. The No. 2 topic, at 15%, was another Mashable story, this one about a Japanese journalist being held in Afghanistan who used a captor’s cell phone to tweet his location. That was followed by the Koran controversy at 13%, and then two technology-focused subjects. Fourth, at 10%, were several stories about Google, including the company’s new search function called "Google Instant" which displays results as soon as users type in their queries. Fifth, at 7%, was a report that Apple had reversed its position on banning Flash-derived applications for its iPhone, thus enabling developers more freedom for creating applications. The Washington Post column by Stiglitz and Bilmes reopened criticism over the merits and consequences of the Iraq War. For the large majority of those commenting, residual anger over the war was obvious. "By far the most costly war in our history," declared Stram at Done That. "A huge, historical blunder made possible by criminals and sheep." Many bloggers connected the costs of the war to other domestic problems facing the country. "To anyone with more than 50 brain cells, that the Iraq ‘war’…was largely responsible for America’s dying economy was obvious," stated Leo Sigh. "When billions of dollars a week are going to Iraq and Afghanistan, it doesn’t take an economic genius…to figure this out…The immense amount of money for the illegal invasion, plus the money still going to Iraq and Afghanistan, means the US will never really get over this recession, which many experts outside the US concluded years ago." "According to my calculations (check me on this if you like) we could run this deficit for over 73 years before we approach the cost of the Iraq war," estimated Brushfire. "It seems that Americans are OK with preserving the wealth of the very rich, OK with spending unimaginable fortunes on war, but not OK with caring for the elderly and sick. What does that say about us?" It was conservatives, though, that congregated around the September 4 Washington Post article about the origins of a Martin Luther King quote on the Oval Office rug. Most cited it as a reflection of President Obama’s lack of knowledge. Gypsy wrote on the Pirate King blog that "the error perfectly encapsulates the shallowness of Barack Obama’s intellect and his lack of rigor." "Obama’s also no historian; or at least chooses to ignore history," SmokeBoater wrote on his LiveJournal blog. "Well it seems that the folks who make the rugs for the White House need to spend a little bit more time looking at primary source documents as well," wrote Gene Clyatt of the blog a Squirrel in Babylon. Some bloggers took it a step farther. Keith Conrad of the blog ProductionNinja wrote that the error on the rug was the "single most public and embarrassing typo in human history." The most watched news video on YouTube last week was an example of a unique phenomenon that has arisen in recent years as online video has grown in popularity. The top clip was from the Philip DeFranco Show, a popular YouTube-based show in which the host talks directly to the camera about a series of topics. This particular episode included background information about the church planning the Quran burning and other material, such as commentary about Jersey Shore reality star Snooki. It received more than 800,000 views. There are several popular young people with their own shows on YouTube. These hosts, like DeFranco and Ray William Johnson, post their own commentary along with items they find on the internet. According to Monica Hesse in a September 14 Washington Post article, "…laissez-faire, juvenile production is exactly what works in the upper echelons of YouTube." DeFranco’s popularity is supported by the fact that this is his third time this year that he has appeared among the most viewed news clips, including the weeks of April 12-16 and August 23-27. He posts his show daily Monday through Thursday and his channel has been viewed over 46 million times since joining You Tube in 2006. The content in this video may not be acceptable for all viewers. The No. 2 YouTube news video was closed circuit footage from a cruise liner hitting rough seas off the coast of New Zealand set to dramatic music from the movie Inception. Several people were injured on the ship. The video received more than half a million views by the end of the week. 1. An episode of the online Philip DeFranco Show, a popular You Tube-based show. 2. Footage from the Pacific Sun Cruise Liner in very heavy seas. 3. A video from a German comedy group known as Die Aussenseiter about the end of the summer. 4. New Jersey Governor Chris Christie responding to a question from a teacher at a town hall.